I should of posted these on Inauguration Day. We had a huge breakfast at our home with friends and family and projected the whole ceremony on our wall. It was fabulous. The food was amazing thanks to my husband who really should be a full time baker and not a Ph.D student. He made individual pop-up pancakes. I'm renaming them Patriotic Pancake Cups and I want to have them every single day so that I can be reminded of how excited I am about our new prez. I am still in celebration mode especially after reading the NY Times today. Beat eggs slightly with a fork in a large bowl. Beat in remaining ingredients until smooth. Fill cups about half full. Reduce temperature to 350* and bake for an additional 10 minutes. 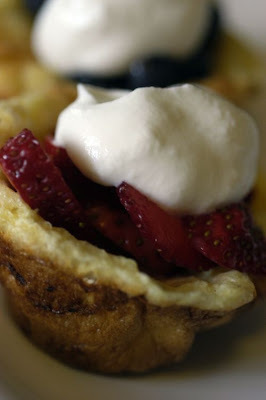 Serve warm with strawberries, blueberries and homemade whip cream. Nos estamos muito felizes tb com o novo Presidente! Que delicia essa panqueca heim??? Vem vcs dois aqui fazer umas pra gente!!! Beijinho!